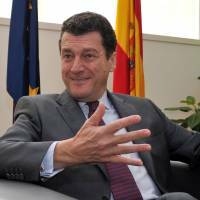 Spanish Ambassador Miguel Navarro is eager to turn the eyes of Japanese to the lesser known historical footnotes that connect Japan and his country as the 400th anniversary of bilateral exchanges is celebrated. “The two countries have had a deep relationship for 400 years devoid of any conflict or confrontation,” Navarro points out. When Spanish Prime Minister Mariano Rajoy visited Japan last week to meet with Emperor Akihito and Prime Minister Shinzo Abe, he also went with the 64-year-old Navarro on a trip to Fukushima Prefecture. There, Rajoy attended the opening of an exhibition in the Fukushima Prefectural Museum of Art featuring the works of contemporary Spanish artist Jose Maria Sicilia. The exhibition, which will run until Dec. 1, is dedicated to the disaster-hit Tohoku region. It features paintings and installations created under themes related to the tsunami-devastated coast and the wrecked Fukushima No. 1 nuclear plant. Some artworks were created during a workshop Sicilia held for children from the area. To mark the 400th anniversary, a series of projects, including some sponsored by the Japanese and Spanish governments, are planned through next year, such as exhibitions, seminars and business forums, Navarro said. In 1613, the Sendai feudal lord Date Masamune sent the Keicho Mission to the Vatican and Spain to negotiate direct trade with Spanish possessions in Mexico in exchange for accepting Christian missionaries in the Sendai feudal domain. Hasekura Tsunenaga, a samurai retainer serving Date — who was also called Francisco Felipe Faxicura after being baptized in Spain — was chosen to lead the diplomatic mission of about 180 members. For the first leg of their journey, they sailed across the Pacific to what was then the Spanish colony of Mexico in the San Juan Bautista, a European-style ship that had been built in Sendai. After making their way to Spain, the mission met King Philip III. They then moved on to the Vatican to meet Pope Paul V.
Hasekura could not complete the mission due to political changes that led to the oppression of Christianity in Japan and came back to his native land seven years after his departure in 1620. A replica of the San Juan Bautista (St. John the Baptist in English) has been displayed for many years at the Miyagi San Juan Bautista Museum in Ishinomaki, Miyagi Prefecture. The vessel suffered minor damage from the March 11, 2011, tsunami, while roughly half of the museum was destroyed. “Now the museum has been rebuilt and is reopening in November — with the restored replica of the ship,” Navarro said with a smile. In June, Crown Prince Naruhito made his sixth visit to Spain and attended a series of events in five cities to mark the 400th anniversary of bilateral exchanges. One of his destinations was Coria del Rio, near Seville in southwestern Spain. Navarro said the Keicho Mission stopped at this city and some Japanese — mostly Christian retainers of the Sendai feudal domain — settled there. Even today, about 600 Japanese descendants, with “Japon” or “Xapon” (meaning Japan in Spanish) as their family name, live in the city. “Probably, some of them became Christians in Spain, and decided to have a family, and stayed there,” Navarro said. The Crown Prince met some of the descendants at a party held in his honor. As a token of continuing ties between the two countries, he planted a cherry tree next to a statue of Hasekura Tsunenaga that stands in a city park. The statue was presented to the city in 1992 by Miyagi Prefecture to commemorate exchanges between people from Miyagi and Coria del Rio the previous year. Navarro was born in Saragossa, northeastern Spain, and attended law school there. He later studied in the United States and attained a master of laws from Columbia University. 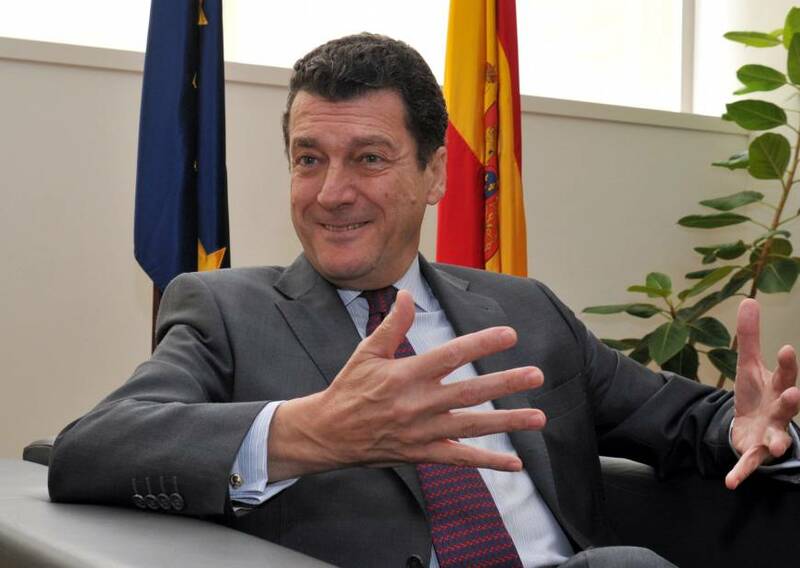 A diplomat since 1979, Navarro has served as ambassador to Poland and as the Spanish Foreign Ministry’s secretary-general for the European Union. He was tapped as envoy to Japan in January 2011. Navarro said he had always wanted to come and work in Japan since his first visit to the country, which took place while he was stationed in South Korea from 1978 to 1980. He said Japan was a popular country in Spain since his youth because of the Tokyo Olympics in 1964. “Judo then became an Olympic discipline,” Navarro said, adding that he took part in the sport from age 12 to 18. Madrid, along with Istanbul, competed with Tokyo to host the 2020 Summer Olympic Games. The ambassador said Tokyo put together a fantastic bid.